Marla Inez Gadsby age 74 went to be with the Lord on January 24, 2019. Marla was born on June 3, 1944 in Los Angeles, California. She was the daughter of Ralph and Inez Grigg and was raised by them in the San Francisco Bay area. After graduating from college Marla worked for Kaiser Industries in California before moving to Washington, DC in 1970. There she worked for Wilmer, Cutler and Pickering law firm before marrying John William (Bill) Gadsby in 1972. After raising her two children Caryn Beth and Edward Ralph, Marla worked for the Fairfax County school system. After Bill retired in 2009, they moved from the Washington, DC area and resided in Naples, Florida and Broomfield, Colorado. Marla was member of Lord of Life Lutheran Church in Fairfax and Emanuel Lutheran Church in Naples. 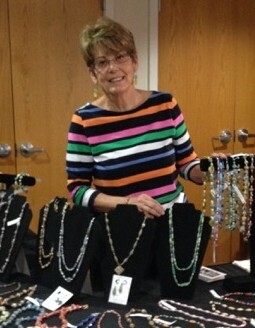 It was from these two churches she pursued one of her most cherished recent activities—building a group of women volunteers who made jewelry from paper beads and sold the necklaces and earrings at church events and other local fairs. All of the proceeds went to support the Village of Hope School in Haiti. Marla was also a creative potter who made many beautiful pieces and took great pleasure in giving them to others. Marla is survived by her husband Bill, her brother Ron Grigg, her children Caryn and Ed, son-in-law Peter, and her three granddaughters—Hannah, Bethany and Emmie. Marla was predeceased by her sister Millie. A Memorial Service is planned for Marla in the Fairfax, Virginia area in the Spring of 2019. Details will be announced at a later date. With Marla’s passing, we all lose a gentle and generous spirit who always thought of others before herself, pursued her interests with a passion, and always greeted you with her welcoming smile. She will be missed dearly by all whose path she crossed.